It’s that special day of the year again, when people around the world unite to share their love for Nutella – that’s right, it’s World Nutella Day! 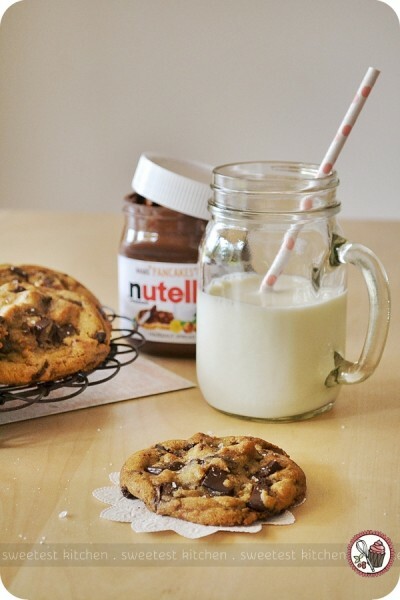 Almost everyone loves a bit of Nutella now and then (or all the time). Personally, I haven’t enjoyed anything with Nutella in it for a while, except a lick of the knife when I’m making a sandwich for my children, who sometimes even indulge in a slice of Nutella fairy bread! So I’ve used the excuse of World Nutella Day to make something absolutely extravagant. Extravagant, and also humongous, at over 3-inches across. These beauties are bursting at their seams with warm, gooey Nutella. 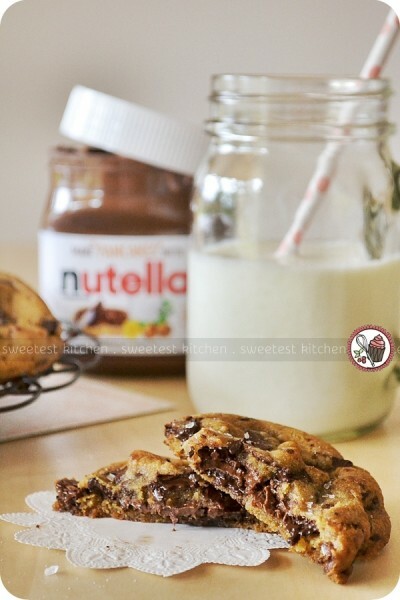 Surrounding the sweet center of Nutella is a browned butter and sea salt-infused chocolate chunk cookie, made with pure Lindt 70% chocolate chunks. On top of each morsel is a sprinkling of sea salt. So extravagant, it’s not even funny. I actually felt guilty making these. What I loved about the cookies: they are delicious and bursting with amazing flavors of toffee-ish brown butter, dark Lindt chocolate, gooey Nutella and flecks of sea salt. The flavor simply could not be improved on as it’s absolutely perfect. What I didn’t like about the cookies: crispy edges. I know how not to overbake a cookie, and trust me, I didn’t overbake these. The edges were just crispier than I prefer. The middles, though, were lovely and gooey. I saw these cookies originally on FoodGawker, posted by Annie’s Eats, and this is the recipe that I used. I only made some minor alterations, which were using vanilla bean paste instead of vanilla extract, using creme fraiche instead of Greek yoghurt or sour cream, using chocolate chunks instead of chocolate chips (although admittedly, I dumped in about a tablespoon of leftover chocolate chips that I had in the pantry), and lastly, letting the dough flavorize (is that a word?) in the refrigerator for 24 hours. It appears that the original recipe originated from Ambitious Kitchen, which is a perfect place for such an ambitious cookie like these. This is one amazing cookie and I would highly recommend making these when you really feel like indulging in something so delicious. 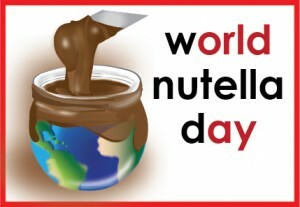 Sure, they’re packed full of unhealthy things, but come on, it’s World Nutella Day. Live a little. I used my new double-layer cookie sheet for the first time to make these, and the cookies baked up gorgeous and puffy, unlike my first test batch on a regular old baking tray. However, accidents do happen…. 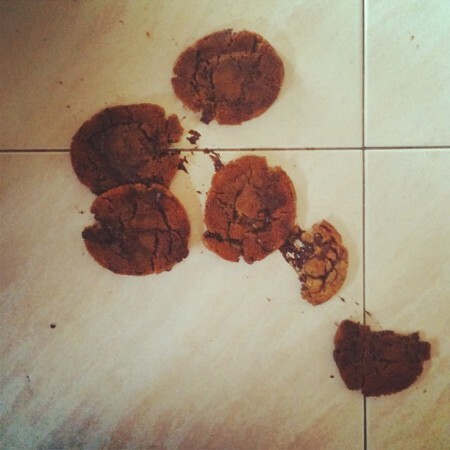 A batch of these cookies fell straight on to the floor, bending the corner of my brand new cookie sheet. I was just setting the tray down from taking it out of the oven, when I realized my 8-month-old baby had used the knobs of the kitchen drawers to stand up; I knew that in one second his little hand would accidentally pull the drawer out and he’d crash down on to the hard tile floor, and probably would hit his head very hard. I sat the tray down, not even looking where it was going, but just going by feel that it was on the trivets on the counter, and not taking my eyes off that little boy. I reached him in time, but as I pulled him off the drawer knobs, I heard the tray crash. I must have set the tray off-balance on the trivets, and as I turned to get bubba, it made it’s way off the trivets and over the edge of the counter. Sigh. Oh well, I didn’t need a full 2-dozen of these cookies anyway, but I am a bit upset about my bent cookie sheet. For the recipe, I will refer you to either Annie’s Eats or Ambitious Kitchen. Enjoy! World Nutella Day is brought to you by Ms. Adventures in Italy and Bleeding Espresso. Oh no! What a shame about the lost cookies – and the bent cookie sheet! OMG- those look absolutely incredible. I love crispy edges and gooey centers so I think they’d be right up my alley 🙂 Amazing photos too!